Getting adopted is tough for older animals. Would-be owners often overlook these pets for younger companions. The Black Canyon Animal Sanctuary found a perfect solution. Who needs a loyal friend and companion more than a homebound senior citizen? Who needs to be loved and cared for more than an abandoned older dog or cat? Debbie Faulkner, founder of Black Canyon Animal Sanctuary in Crawford, Colorado, recognized the unmet needs of senior people and senior pets, and started a community outreach program to bring them together. She calls it the Silver Whiskers Program. Our friends over at Petcentric bring us this story: “At Black Canyon Animal Sanctuary, Debbie takes in dogs and cats who have been abandoned or abused, and gives them the love and care they need to rehabilitate and trust people again. But even when these dogs and cats are ready to be someone’s pet, it’s not so easy to find suitable homes for them. Senior pets just aren’t as easily adopted as younger pets. But senior pets are often an ideal match for senior citizens. Older pets are generally calmer and are already trained. But the senior adults who most need a furry companion are often unable to afford or properly care for them. That’s where Silver Whiskers and its generous donors make the connection work. They carefully match up senior people with a senior pet who has rehabilitated at the sanctuary. Silver Whiskers covers all the costs of owning a pet, including food, supplies and veterinary care. They also provide transportation to and from the veterinarian. A Senior Whiskers volunteer will arrange a sleepover so the pet and person can see how they like each other. 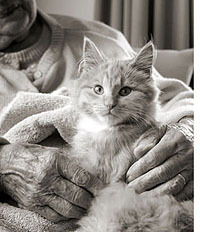 Once the match is made, the senior pet has a home for as long as the senior person is able to care for him. The benefits to the senior pets are obvious. They get a home and someone to love and care for them. They get plenty of attention because their owner is home all day. But the benefits to senior people are even greater. A dog or cat in the home gives the person a friend to love, care for, and interact with everyday. A pet’s unpredictability breaks up stale routines and creates joyful moments of spontaneity, and provides something delightful to look forward to each day. A pet can dig up satisfying feelings that were buried – feelings of being relevant, needed and useful. A cat, with a unique personality, provides something interesting to talk about. And a dog, who will go on walks, can actually help a senior make new friends, as nothing can break the ice and invite neighborly interaction like a wagging tail. Take a look at how well this program works in our Snouts in Your Town video. If you want to see the dogs and cats who need adopting, or want to donate to this program, go to BlackCanyonAnimalSanctuary.com. You can find an older animal to adopt near you by doing a search on Adopt-a-Pet.com and selecting “senior” from the age drop down menu. Senior pets rock!